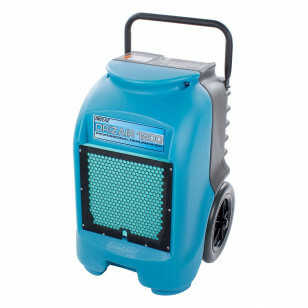 This DrizAir 1200 dehumidifier by Dri-Eaz is definitely one of our best selling units. It will remove up to 18 gallons of water per day under optimum conditions, and on average it will remove 8 gallons per day when tested in a controlled environment. When there is more liquid in the air, and the temperature is around 90° F, you receive the best results from this machine. It comes with a 40-foot drain hose and a 25 foot power cord for maximum coverage. The premium 3M high flow air filters, which are listed below, provide the best results for any type of flood restoration job. All of our Dri-Eaz units are UL, & C-UL listed for safety approval ratings. Dri-Eaz DrizAir dehumidifiers reduce humidity in enclosed structural environments by removing water vapor from the air. With proper use, DrizAir dehumidifiers can help dry wet materials like carpet, carpet pads, floors, walls, building contents and more. Using DrizAir dehumidifiers may also prevent secondary damage caused by high humidity. For best results, we recommend you use one of our fast drying air moving carpet dryers. The air movers help to move air around the moist area, which helps to speed up the evaporation process by lifting moisture into the air. DrizAir refrigerant dehumidifiers operate by pulling moist air in across a very cold evaporator core. The moisture condenses, or "freezes", on the coil. At intervals, the machine will go into defrost mode, warming the frost back to water. The water collects in a tray and leaves the unit through a drain hose or pump. If you're looking for more options, please take a look at our complete line of dehumidifiers, which includes our crawlspace dehumidifier. Removes up to 18 gallons a day of liquid, under optimum conditions. Super convenient size is extremely portable, weighing only 80 pounds. Rugged rotomolded housing allows you to stack up 2 units onto each other for storage. Electronic touch-pad controls make the DrizAir dehumidifier very simple to use. Rigid handle & rugged housing are designed for the toughest service jobs. This is a review for the Dri-Eaz® DrizAir® 1200 Classic Refrigerant Dehumidifier - 18 gals/day Max Removal.